Analyzing 16 record-efficiency solar cell materials, the paper presents opportunities to improve photovoltaic efficiency using nanoscale light management and to enhance carrier collection with innovative materials science and engineering strategies. 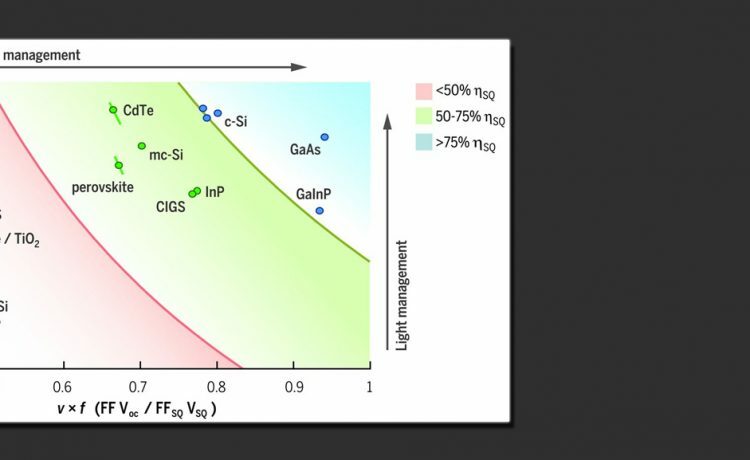 The article describes the electrical characteristics of 16 photovoltaic material geometries that have led to solar cells with record power conversion efficiencies laying between 10 and 29%. The authors start with a comparison between the current and voltage of these cells and the limiting values predicted by the Shockley-Queisser thermodynamic detailed-balance model. Then, the key limiting factors of each of the 16 researched materials are identified, showing the losses originating in either incomplete light absorption or charge carrier collection. Finally, the authors discuss the prospects for practical applications and large-scale fabrication. AMOLF’s Light Management in New Photovoltaic Materials (LMPV) program aims to provide solutions for these light management and carrier collection problems. It has recently demonstrated novel concepts to improve solar energy conversion efficiencies in wafer-based Si solar cells, and thin-film Si, organic, CuInGaSe, and perovskite solar cells. In addition, the LMPV scientists are developing alternative 3D structuring techniques to reach efficiencies beyond the fundamental limits of solar cells with conventional planar designs. As photovoltaic records are continually being broken, up-to-date versions of the charts presented in the paper will be maintained at: lmpv.amolf.nl/SQ. The article is authored by LMPV group leaders Albert Polman, Erik Garnett, and Bruno Ehrler, postdoc Mark Knight, and visiting scientist Wim Sinke (ECN).